An electric bus that recharges itself at bus stops will go on trial on Hong Kong roads in about two months. 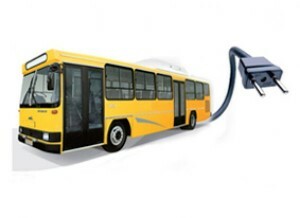 The so-called supercapacitor bus – now being used at the World Expo in Shanghai – is being brought to the city by Kowloon Motor Bus as it seeks ways to reduce emissions from its diesel-burning fleet. The bus has a quick-charging electricity storage device that can propel it for a kilometre after charging for 30 seconds and five to nine kilometres after a full charge taking three minutes. One kilometre might seem a short distance, but the bus company’s deputy managing director, Evan Auyang, said this amounted to three to four blocks and as the buses stopped often, the pauses should allow enough time for quick charges. “Chargers will be installed at our bus stops so that the bus can recharge while loading and offloading passengers, but we won’t need a charger at every stop to begin with,” Auyang said. The bus will arrive at KMB’s Lai Chi Kok depot in July for the company to test its performance in the city’s hot, humid weather and hilly terrain before deciding whether it can be used to replace some of the older models. When fully charged, the air-conditioned bus can travel for five kilometres with a full load and up to nine kilometres empty. Its top speed is 55km/h, compared to 70km/h for the diesel buses, so it would only be used on urban routes, where the average speed was 50km/h. Auyang said the technology would evolve quickly, with US researchers working at doubling power capacity in the same charging time. The bus would cost more than diesel-fuelled single-deckers, which cost about HK$2 million, but it would be cheaper than hybrids and would cut fuel costs by up to 75 per cent. A former contractor who worked for BP claims the oil conglomerate broke federal laws and violated its own internal procedures by failing to maintain crucial safety and engineering documents related to one of the firms other deepwater production projects in the Gulf of Mexico, according to internal emails and other documents obtained by Truthout. The whistleblower, whose name has been withheld at the person’s request because the whistleblower still works in the oil industry and fears retaliation, first raised concerns about safety issues related to BP Atlantis, the world’s largest and deepest semi-submersible oil and natural gas platform, located about 200 miles south of New Orleans, in November 2008. Atlantis, which began production in October 2007, has the capacity to produce about 8.4 million gallons of oil and 180 million cubic feet of natural gas per day. It was then that the whistleblower, who was hired to oversee the company’s databases that housed documents related to its Atlantis project, discovered that the drilling platform had been operating without a majority of the engineer-approved documents it needed to run safely, leaving the platform vulnerable to a catastrophic disaster that would far surpass the massive oil spill that began last week following a deadly explosion on a BP-operated drilling rig. BP’s own internal communications show that company officials were made aware of the issue and feared that the document shortfalls related to Atlantis “could lead to catastrophic operator error” and must be addressed. Indeed, according to an August 15, 2008, email sent to BP officials by Barry Duff, a member of BP’s Deepwater Gulf of Mexico Atlantis Subsea Team, the Piping and Instrument Diagrams (P&IDs) for the Atlantis subsea components “are not complete” and “there are hundreds if not thousands of subsea documents that have never been finalized, yet the facilities have been” up and running. P&IDs documents form the foundation of a hazards analysis BP is required to undertake as part of its Safety and Environmental Management Program related to its offshore drilling operations. P&IDs drawings provide the schematic details of the project’s piping and process flows, valves and safety critical instrumentation. BP did not respond to repeated requests for comment for this story. Despite the claims that BP did not maintain proper documentation related to Atlantis, federal regulators authorized an expansion of the drilling project. Last May, Mike Sawyer, a Texas-based engineer who works for Apex Safety Consultants, voluntarily agreed to evaluate BP’s Atlantis subsea document database and the whistleblower’s allegations regarding BP’s engineering document shortfall related to Atlantis. Sawyer concluded that of the 2,108 P&IDs BP maintained that dealt specifically with the subsea components of its Atlantis production project, 85 percent did not receive engineer approval. Even worse, 95 percent of Atlantis’ subsea welding records did not receive final approval, calling into question the integrity of thousands of crucial welds on subsea components that, if they were to rupture, could result in an oil spill 30 times worse than the one that occurred after the explosion on Deepwater Horizon last week. “BP’s recklessness in regards to the Atlantis project is a clear example of how the company has a pattern of failing to comply with minimum industry standards for worker and environmental safety,” Sawyer said. The oil spill blanketing roughly 4,000 square miles in the Gulf of Mexico after the Deepwater Horizon explosion, which killed eleven workers, was exacerbated, preliminary reports suggest, by the failure of a blowout preventer to shut off the flow of oil on the drilling rig and the lack of a backup safety measure, known as a remote control acoustic shut off switch, to operate the blowout preventer. Congressman Henry Waxman, chairman of the Committee on Energy and Commerce, sent a letter Thursday to BP Chairman and President Lamar McKay seeking documents related to inspections on Deepwater Horizon conducted this year and BP’s policy on using acoustic shut off switches in the Gulf of Mexico. Whether it’s the multiple oil spills that emanated from BP’s Prudhoe Bay operations in Alaska’s North Slope or the March 2005 explosion at the company’s Texas refinery that killed 15 employees and injured 170 people, BP has consistently put profits ahead of safety. 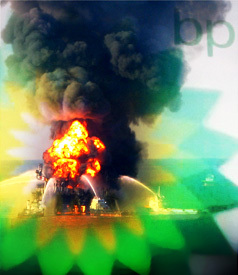 Also on October 25, 2007, BP paid a $50 million fine and pleaded guilty to a felony in the refinery explosion. An investigation into the incident concluded that a warning system was not working and that BP sidestepped its own internal regulations for operating the tower. Moreover, BP has a prior felony conviction for improperly disposing of hazardous waste. In 2007, the Department of Interior’s federal Minerals Management Services (MMS), the agency that monitors offshore drilling practices, fined BP $41,000 for not properly training employees in well control management related to a near blowout due to a rise in gass pressure on the Ocean King Rig five years earlier that forced the evacuation of all 65 workers for two days and halted drilling for a week. According to MMS, Diamond Offshore Drilling, operator of the rig, and BP did not know that the critical safety procedures they employed to try and stop the increase in gas pressure on the Ocean King Rig could also have caused a blowout. “The diverter system was not installed as in the approved plan, had inadequate supports, added right angle turns at the ends, and did not provide for downwind diversions,” MMS said. That’s similar to “what caused the near-blowout in 2002,” according to environmental publication Clean Skies. The incident involving Deepwater Horizon, now the subject of a federal investigation, may end up being the latest example of BP’s safety practices run amuck. The issues related to the repeated spills in Prudhoe Bay and elsewhere were revealed by more than 100 whistleblowers who, since as far back as 1999, said the company failed to take seriously their warnings about shoddy safety practices and instead retaliated against whistleblowers who registered complaints with superiors. In September 2006, days before BP executives were scheduled to testify before Congress about an oil spill from a ruptured pipeline that forced the company to shutdown its Prudhoe Bay operations, BP announced that it had tapped former federal Judge Stanley Sporkin to serve as an ombudsman and take complaints from employees about the company’s operations. That’s who the whistleblower complained to via email about issues related to BP’s Atlantis operations in March 2009 a month after his contract was abruptly terminated for reasons he believes were directly related to his complaints to management about BP’s failure to obtain the engineering documents on Atlantis and the fact that he “stood up for a female employee who was being discriminated against and harassed.” The whistleblower alleged that the $2 million price tag was the primary reason BP did not follow through with a plan formulated months earlier to secure the documents. “We prepared a plan to remedy this situation but it met much resistance and complaints from the above lead engineers on the project,” the whistleblower wrote in the March 4, 2009, email to Pasha Eatedali in BP’s ombudsman’s office. Additionally, he hired an attorney and contacted the inspector general for the Department of the Interior and MMS and told officials there that BP lacked the required engineer-certified documents related to the major components of the Atlantis subsea gas and oil operation. In 2007, MMS had approved the construction of an additional well and another drilling center on Atlantis. But the whistleblower alleged in his March 4, 2009, email to Eatedali in BP’s Office of the Ombudsman that documents related to this project needed to ensure operational safety were missing and that amounted to a violation of federal law as well as a breach of BP’s Atlantis Project Execution Plan. The ombudsman’s office agreed to investigate. MMS, acting on the whistleblower’s complaints, contacted BP on June 30, 2009, seeking specific engineering related documents. BP complied with the request three weeks later. On July 9, 2009, MMS requested that BP turn over certification documents for its Subsurface Safety Valves and Surface Controlled Subsea Safety Valves for all operational wells in the Atlantis field. MMS officials flew out to the platform on the same day and secured the documents, according to an internal letter written by Karen Westall, the managing attorney on BP’s Gulf of Mexico Legal Team. But according to the public advocacy group Food & Water Watch, a Washington, DC-based nonprofit, which became involved in the case last July, BP did not turn over a complete set of materials to MMS. “BP only turned over ‘as-built’ drawings for [Atlantis’] topsides and hull, despite the fact that the whistleblower’s allegations have always been about whether BP maintains complete and accurate engineer approved documents for it subsea components,” Food & Water Watch said in a 19-page letter it sent to William Hauser, MMS’s Chief, Regulations and Standards Branch. During two visits to the Atlantis drilling platform last August and September, MMS inspectors reviewed BP’s blowout preventer records. Food & Water Watch said they believe MMS inspectors reviewed the test records and failed to look into the whistleblower’s charges that engineering documents were missing. The blowout preventer, however, is an issue at the center of the Deepwater Horizon spill. An MMS spokesperson did not return calls for comment. MMS does not have clean hands when it comes to its oversight role. The agency was embroiled in a scandal when a 2008 report by the Interior Department’s inspector general found that regulators “had inappropriate relationships with industry that could compromise their objectiveity.” Those relationships were sexual and also included sharing drugs, such as cocaine, with industry personnel. Last October, Food & Water Watch filed a Freedom of Information Act (FOIA) request for expedited processing, seeking documents from MMS that indicate BP “has in its possession a complete and accurate set of ‘as built’ drawings … for its entire Atlantis Project, including the subsea sector.” “As-built” means lead engineers on a specific project have to make sure updated technical documents match the “as-built” condition of equipment before its used. MMS denied the FOIA request. “MMS does not agree with your assessment of the potential for imminent danger to individuals or the environment, for which you premise your argument [for expedited response]. After a thorough review of these allegations, the MMS, with concurrence of the Solicitor’s Office, concludes your claims are not supported by the facts or the law,” the agency said in its October 30, 2009, response letter. In response, MMS said that although some of its regulatory requirements governing offshore oil and gas operations do require “as built” drawings, they need not be complete or accurate and, furthermore, are irrelevant to a hazard analysis BP was required to complete. Unsatisfied with MMS’s response, Food & Water Watch contacted Rep. Raul Grijalva (D-Arizona), a member of the Committee on Natural Resources and chairman of the subcommittee on National Parks, Forests and Public Lands, about the issues revolving around BP’s Atlantis operations and provided his office with details of its own investigation into the matter. On January 15, Westall, the BP attorney, wrote a letter to Deborah Lanzone, the staff director with the House Subcommittee on Energy and Minerals, and addressed the allegations leveled by Food & Water Watch as well as indirect claims the whistleblower made. Westall noted in her letter that “all eight BP-operated Gulf of Mexico production facilities” received safety awards from MMS in 2009. Westall maintained that the whistleblower as well as Food & Water Watch had it all wrong. Their charges about missing documents has nothing to do with Atlantis’ operational safety. Rather, Westall seemed to characterize their complaints as a clerical issue. “[C]ommunications between MMS and congressional staff have suggested that while the company by law must maintain ‘as-built’ documents, there is no requirement that such documents be complete or accurate,” the letter said. “This statement, if an accurate interpretation of MMS authorities, raises serious concerns” and requires “a thorough review at the agency level, the legal level and the corporate level. The world’s largest oil rig cannot continue to operate without safety documentation. The situation is unacceptable and deserves immediate scrutiny. On March 26, MMS launched a formal investigation and is expected to file a report detailing its findings next month.